"What you put into a business is what you ultimately get out of it." Royal Tent & Tarp is a leading manufacturer and supplier of tents, and a wide range of associated equipment, to clients throughout Africa, Madagascar and the Seychelles. Founded in 2002, Royal Tent & Tarp now has 24 branches across South Africa, and is recognised as a significant player in the industry. The company is part of the independently-owned Royal Group, which also includes Royal Plastic Chairs, Royal Plastic Tanks and La Principessa, a bridal and evening wear retail business. Royal Tent & Tarp manufactures and sells a wide of tents from marquees and high-end Bedouin and stretch tents for functions and weddings, to robust, durable tents for disaster relief, military use and even warehousing. Not to mention smaller Alpine and aluminium framed tents. They also supply specialised trailers, air conditioning, stages, lighting, draping and décor, mobile kitchens, freezers and VIP toilets, and a range of furniture chairs and tables; even popcorn and candyfloss machines. 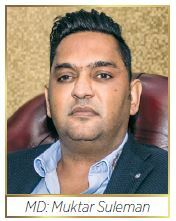 Husband and wife team, Muktar Mahomed and Zayeeda Suleman have a fundamental business philosophy that what you put into a business is what you get out. They have painstakingly built up a large loyal client base over the years, and have long-standing relationships with suppliers too. "These strong relationships are what make us a leader in our field, giving customers the confidence that we'll deliver quality products in a way that meets their operational and environmental standards," says Muktar. "Uncompromising product quality and customer service is central to our success, but we also focus on value. We aim to be the lowest cost supplier in our sector, without compromising quality." With a full time staff of 170 people, they also recognise the importance of their staff. "Clearly, we are very goal-orientated," says Muktar. "And we strive to ensure that this work ethic forms part of the company culture. We believe that employees will make a longterm commitment to our company if we give them a good reason to stay. We make it a priority to show respect to our staff, offer attractive commissions and incentives and we focus on skills development, with ongoing training programmes and opportunities for growth. This all forms part of our strong workplace culture." The owners, also take pride in their communication to their staff. "We understand that internal communication is a vital ingredient for successful employee participation and facilitates the development of effective work commitment. We aim to always formulate and impart clear and consistent messages to all employees and inform them of changes that impact affect us all. We have weekly meetings with our key staff and look for their input on challenges or changes." Royal Tent & Tarp is an ambitious competitor in their market, but Muktar and Zayeeda Suleman believe that every organization has a role to play in minimizing the environmental impact of their work practices to help protect, and follow the three R's of greening their workplace: Reduce, Reuse and Recycle. "At Royal Tent & Tarp, we have adapted our processes to reduce the generation of waste, and ensure that all waste is disposed of safely. We educate our employees so that the correct procedures are followed, and choose materials with recyclable or reusable packaging, and reuse containers and packaging wherever possible." The company works with raw material suppliers to reduce waste, returning plastic bags and drums for reuse and reducing deliveries with managed procurement. They also recycle reject plastic chairs. "We believe that every bit helps," says Zayeeda, "and if every business committed to re-using the reverse of old correspondence for notepads, reusing old envelopes for internal mail, and recycling computer cartridges, it would make a significant change. They also see it as their responsibility to assist the less fortunate. Over the years, charitable projects have included supplying blankets to the poor in winter, and providing essential food hampers and hygiene packs to the needy. Since 2016, however, their focus has been on their daily feeding scheme, where they feed up to 300 homeless people a day from their branch in Alice Street in Durban. The Royal Group has plans to expand the business in 2018. One of their new projects is the opening of a Platinum Drip Bar and Beauty Spa, a third La Principessa store and two additional tent stores. Services / Products:Manufacturers and Sale of Tents, Chairs, Freezers, Chillers, VIP Toilets, Fibre-glass and Chromodek flushing and non-flush toilets etc.